Manila, a city capital of the island of Luzon, and of the whole Philippine archipelago, near the mouth of the Rio Pasig, which empties into the bay of Manila; lat. 14° 36' ST., Ion. 121° E.; pop. (including the suburbs) from 140,-000 to 150,000, of whom the Spaniards and Creoles are about one tenth, the remainder being native Tagalas, mestizos, and Chinese. Most of the Chinese are engaged,in commerce, and but few in agriculture. The city is divided by the river into two sections, Manila proper and Binondo. The former, which is the military town, is surrounded by lofty walls, and communicates with Binondo by a fine stone bridge 511 ft. long, with 10 arches, first built in 1630, but rebuilt in 1814. The situation of the town is beautiful. On one side is the bay, in a framework of forest-clad mountains declining gradually toward the shore; and on another a picturesque plain, where are the military parade ground and the fashionable promenades, crowded in the evening with showy equipages and gay equestrians and pedestrians. The aspect of Manila proper is somewhat dull and monotonous. The streets are perfectly straight, macadamized, and provided with ample granite sidewalks. The houses, which have in general a sort of palatial appearance, are of two stories, and built in a manner to resist the hurricanes and earthquakes so frequent here. The upper story, commonly occupied by the family, is encircled by a spacious gallery, from which the sun is excluded by large sliding panels with mother-of-pearl panes, sufficiently transparent to admit light to the apartments. In this town are the cathedral and some other churches, with all the monasteries and convents, both of which are numerous; the governor's palace; the citadel, overlooking both towns; the courts of justice, custom house, barracks, arsenal, hospital, and other public buildings. Binondo, on the N. bank of the river, is much larger and more animated; but the streets are less regular and many still unpaved. Numerous canals, crowded with pirogues, gondola-, and other boats, intersect this suburb, in which reside the wealthy merchants, Spanish, English, Indian, Chinese, and mestizos. The newest and most elegant houses on the banks of the Pasig, though of unassuming exterior, are highly adorned within. Each house has a binding place from the river, and little bamboo huts to which the inhabitants repair several times a day for bathing. In other parts of the town there are sombre and massive structures interspersed with airy bamboo cottages perched on posts, in the midst of avenues of tropical trees, giving to the place an appearance at once Spanish and oriental. The only square worthy of remark in either town is the Plaza Mayor in Manila proper, some 800 ft. square, and embellished with a tine statue of Charles IV. of Spain, presented by Ferdinand VII. in 1824. The climate is intensely hot. but tolerably salubrious; hurricanes occur frequently, and heavy rains fall at short intervals, especially during the wet monsoons, winch prevail five months out of the twelve. The temperature is equable, seldom rising above 99° F. or descending below 70°. Vessels of deep draught have to anchor at Cavite, about 7 m. distant; but the anchorage in the port of Manila is excellent for small vessels. 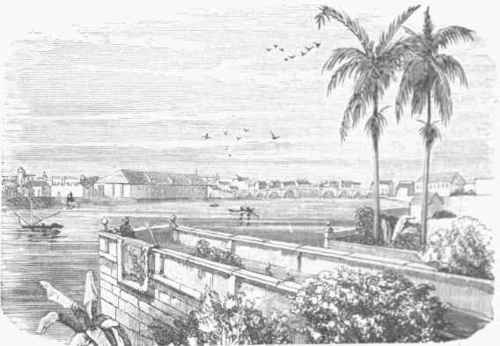 Manila is by law the sole emporium of foreign trade with the Spanish East Indies. The chief articles of export are sugar, tobacco (exclusively to Great Britain and Spain, the latter receiving annually a state tribute out of the tobacco crop to the amount of $800,000), cigars, hemp, coffee, indigo, copper, and gums and other tropical product-. The imports include cotton, linen, woollen, and silk fabrics, manufactured iron, wines beer, etc. The total value of the exports for the year ending Sept. 30, 1872, was $18,679,770 l9: of the imports, $-2,557,227 42; the amount of duties paid on the latter was $4,406 31. The more important commercial relations are with Spain, Great Britain, the United States, France, Germany, China, Chili, and the Hawaiian islands. The tobacco manufacture, a government monopoly, employs 20,-000 workers of both sexes. (For other manufactures, see Luzox, and Philippine Islands.) Educational establishments are numerous in Manila: there are the university of St. Thomas, with 500 students; that of St. John, with 250; a royal marine school (established in 1820), a commercial (1840), and a number of primary schools public, and private. - Manila was founded by the Spaniards in 1571, on the site of a Malay town defended by stockades. Miguel Lo-pez de Legazpi, conqueror of the Philippines and founder of the city, was indefatigable in promoting its growth. He founded the cathedral, the metropolitan church of all Catholic Oceanica, and established a municipal organization, which was continued by Philip II. of Spain, and continues to be the form of municipal government in Manila. Chinese laborers and traders settled here in large numbers, and in time became very turbulent. In 1003 an insurrection took place, and 23,000 Chinese were massacred; notwithstanding which, the Chinese population in 1030 numbered in Manila about 30,000. The severity of imposts and religions persecution again led to insurrection, which terminated with the slaughter of about 25,000 Chinese, and the banishment of the remainder; but they soon again resorted to the city in large numbers, and assisted Admiral Cornish and Sir William Draper in the capture of it in 1702. The English expedition, composed of 2,300 Europeans and sepoys, which sailed from Madras, took the city by storm, after a siege of ten days. The governor and archbishop agreed to pay £5.000,000 to save the rich cargoes then lying in the port; but the king of Spain refused to ratify the offer. Sir William Draper has been rendered conspicuous by his controversy with Junius concerning this ransom. Manila was restored to Spain by the peace of Paris, Feb. 10, 17G3. The Japanese had much trade with the city, and wen- settled in it in large numbers during a portion of the 17th century, before their laws excluded them from all communication With the rest of the world. They imported the raw material extensively used in their manufactures directly from the Philippines. Earthquakes have been frequent and disastrous; in that of 1045, 3,000 lives were lost; and those of 1702, 1824, and 1852 were also destructive of life and property; while in that of June, 1803, about 1,000 persons perished. In March, 1833, about 10,000 huts were burned, some lives were lost, and about 30,000 people left homeless.